With the removal of Acrobat Reader support in Chrome and other browsers, we have seen a big increase in the number of clients asking about this. What we do is convert the Acrobat Forms (FDF and XFA) to HTML5 forms (converting all the PDF form elements into HTML5 Form components). This works really well as a way to display an Acrobat Form on mobile, with no software requirement beyond that of a browser. But that then raises the question of how you can use and save any changes to the forms data. The Acrobat Form file still works very well as a single, self-contained container which can be reused and easily distributed. So we decided the obvious thing was to complete the cycle, by not only converting Acrobat forms to HTML5 but then allowing the HTML5 document to save the data back into the Acrobat Form. FDF is more complex because the data is not so clearly separated out in the PDF file which means it is taking a little longer to add in. Converting Acrobat Forms into HTML5 Forms which can then update the PDF file works very well as a solution for displaying Forms on both mobile and desktop. If you want to try our solution, you can see it in action in our Acrobat Forms examples. 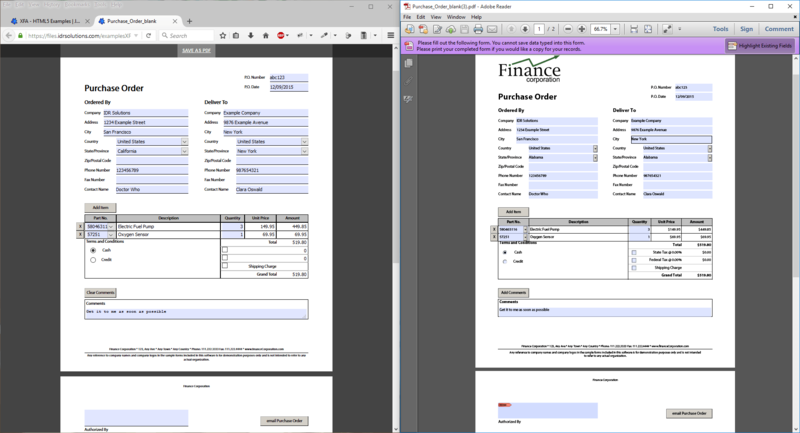 And if you want to understand the technical complexities involved in saving Acrobat Forms, my colleague Sam has a technical article on how to resave forms and we have a whole series of articles on Understanding the PDF File Format. only allow entry in the cents columns. Are the any plans to correct this? Yes there are plans to correct it, Its in our Bug database, but low down in the list. We are happy to prioritize it if you are a server license customer just submit a bug request with your customer ID. I have added as an item to investigate.